Playing with fire and copper is like a box of chocolates. You never know what you are going to get. And you never know if it will stay when you try to preserve it. 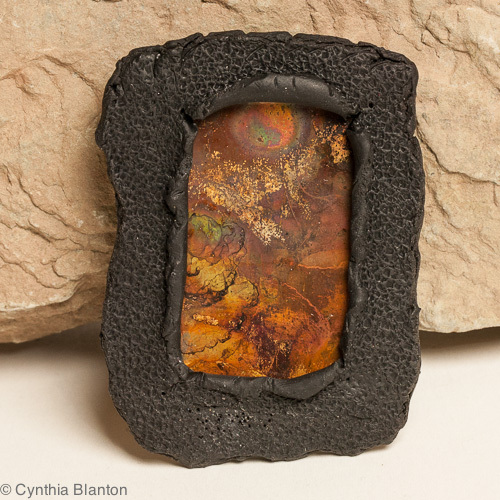 The center of this convertible brooch/pendant is made from copper which was heat treated with my torch. I got an amazing array of colors. Then I sprayed it with PYMII, to prevent further oxidation, and the color stayed. Sometimes a heat patina will go away when you seal it, no matter what you use. Then I framed the copper with some black clay with a torn-out window. The edges are torn too. 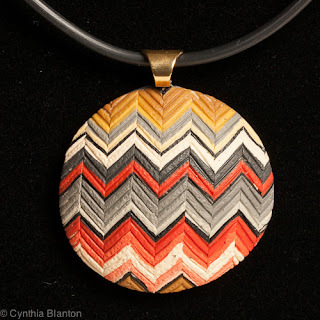 There is more black clay for the backing and the convertible pin back is held in place with a clay covering. 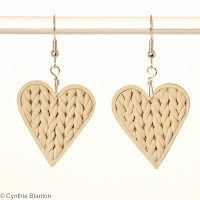 In addition to the heart-shaped faux knit pieces I've been doing using a tutorial by Claire Wallis (on Flickr), I also made some pendants and bracelets using Judy Belcher's Micro Knitting with Polymer Clay tutorial from CraftArtEdu. 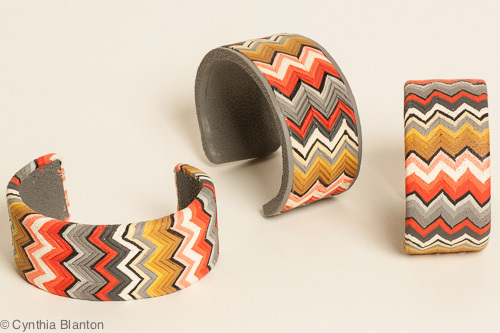 These pieces look like Missoni Knits, and when I displayed them at a craft show, people always felt them to see what they were made of. 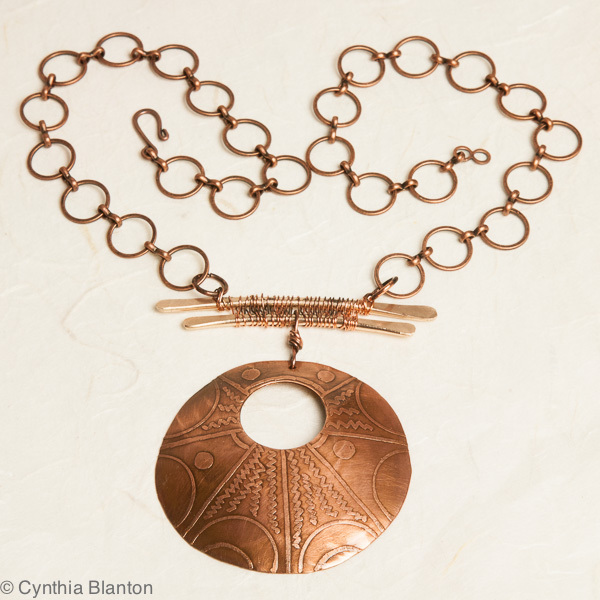 I made this necklace by etching the hand-drawn design on copper and then doming the piece. I used a brown patina to give it a nice warm look. I made two paddles by hammering bronze wire and wired the two pieces together with very thin copper wire. 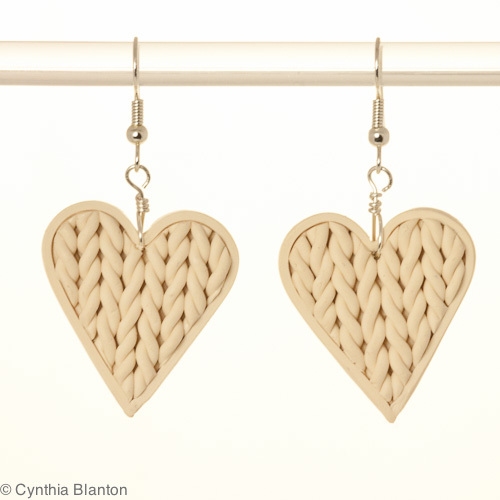 I'm taking a bit of a break from shawl pins and working on some jewelry. I've been experimenting with copper and looking at different patina options. Of course, the best patina I've seen is some that occurred naturally on some old copper flashing. I just wish I had more of it. 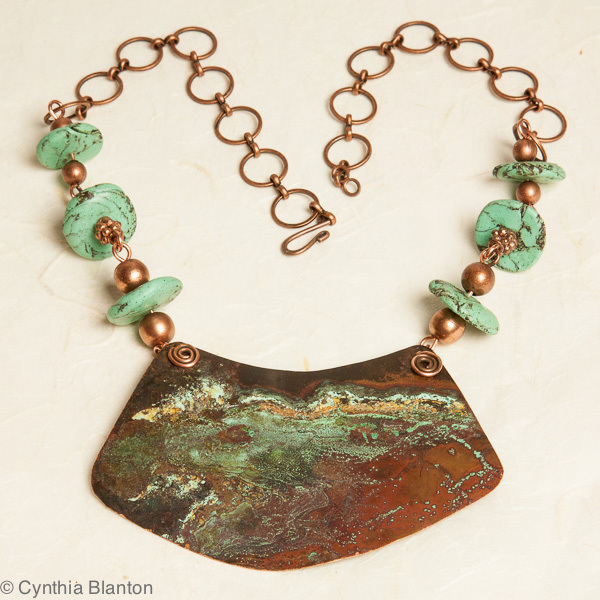 In the necklace below, the disk beads are faux turquoise made of polymer clay and the patina on the copper panel is all natural. I sealed it with Renaissance Wax.